Some of the Shifting Lanes crew went to Pole Position Raceway in Jersey City, NJ for Part-A of a bachelor party this past weekend. The rest of the day is not fit to print in this fine auto establishment, but the karting experience was an awesome start to the day and was a good way to send a bachelor into the wedded-life. 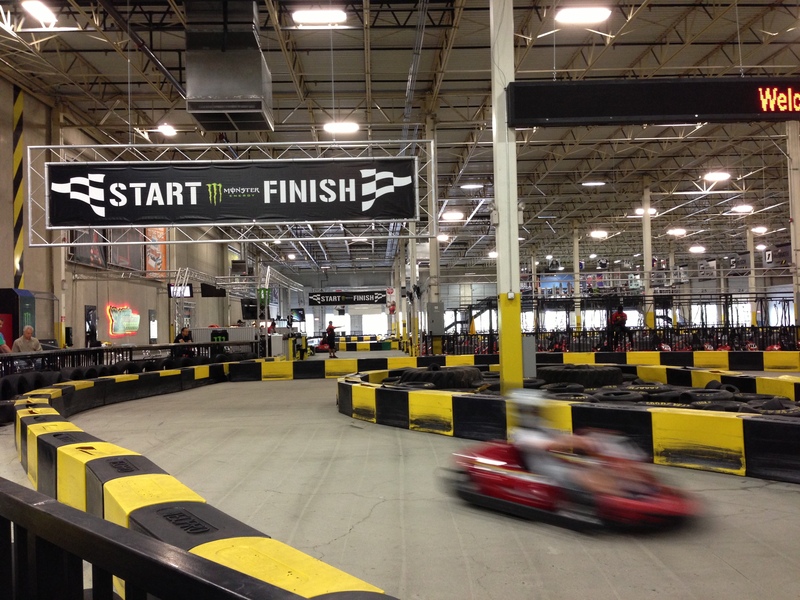 Pole Position Raceway is an all electric indoor go-kart venue that claims a top speed of 45mph. That doesn’t sound so fast in a normal car, but when you’re seated 2 inches off the ground in what is essentially a racing seat bolted on an electric motor, the sensation is completely different. This is not your typical go-kart attraction from Six-Flags where you can navigate the tracks with the brake pedal untouched, in here you have to get technical with your race lines to achieve the quickest time. Ultra-slick, F1 inspired, performance radials, front and rear rubber compound matched to the P2R track surface for minimal push and optimum drift. All of this amounts to a decent karting experience that’ll give you a good rush. The sound of the electric motor also crescendos to a nice high pitched whine reminiscent of open wheel racing. Prior to competing with your fellow racers you get corralled in the pitstop area to watch a safety video and fitted with a helmet. In case you’re grossed out with the thought of putting your head in a community helmet, they provide you with a headsock to keep your sweat to yourself. When it was time to race you jump into your kart, buckle into the 4-pt harness, and queue up into the track. Perhaps for liability purposes the only form of racing available for the group is the hot lap, where you do 14 laps in one race and compete for the quickest time. Other race types would be difficult given how narrow and short the tracks are, which is roughly 3-4 karts wide. There are also other factors that affect the dynamics of the race. For instance, go too slow and you’ll be blue-flagged and slowed so you don’t get in the way of faster drivers, be too aggressive by bumping into other karts and you’ll be black-flagged and eventually kicked out. And if there’s a hazard in a section of the track, the race crew will quickly throttle everyone’s karts to prevent high speed collisions. By the second race I was able to predict the behavior of the car and concentrate more on creating proper race lines. I made sure to hit the proper braking points, grazed the apexes and position the kart in the correct entry point for the next turn, while trying to drift as least as possible. I improved my best lap time by over 1.8 seconds. Unfortunately, my 25.200 time was not fast enough to beat the group’s best of 24.730, and just for reference the Raceway’s best lap time of the week was 23.300. I participated in three 14 lap races that day, which is about a three hour activity. The pricing structure is pretty modest and gets cheaper with subsequent races (even cheaper if you open up an annual membership), Pole Position Raceway is a pretty good way to spend an afternoon having competitive fun. In the least you get to learn the basics of racing and learn it at a great bargain. It’s no substitute for autocross or the racetrack, but in this setting you don’t have to worry about the costs and logistics behind tracking your own car such as the transportation, the tires, the brakes, and the high or low chance of turning your vehicle into scrapmetal. Small edit, just for bragging purposes, I had a Shifting Lanes best time of 24.960 and improved my time from a 25.400 in the first heat. Our group best was our friend Eric who hit a 24.560 in our last race. Very impressive. I HIGHLY recommend this to anyone with $100 and an afternoon to spend. Track day on a budget? You bet.